To complement the existing range of Photron high-performance high-speed imaging products, the FASTCAM SA4 delivers a fully featured system including mega-pixel resolution, high light sensitivity, high dynamic range and low noise at an attractive price level. 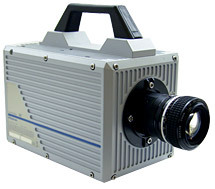 For demanding applications that do not require the highest frame rates but where all other aspects of system specification are important the FASTCAM SA4 is the correct choice. Applications include fluid dynamics, biomechanics, material test, airbag development and test, microscopy and automotive safety testing. The FASTCAM SA4 is 100% compatible with the existing range of Photron products and shares features such as remote keypad with built in view finder for remote operation and support of Photron data acquisition devices. For applications where ingress of dust would be hazardous or external fans are undesirable a sealed case option (FASTCAM SA4 RV) is available. Range Version (RV) option with sealed case to prevent dust or moisture getting inside the camera case where it could damage the internal electronics.